Then do you miss the old time when you are designing circuits using long-channel transistors? 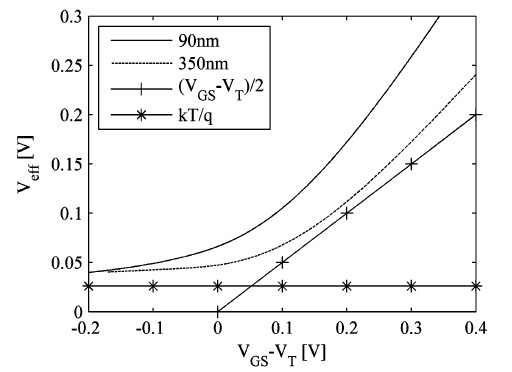 With certain effective gate-source voltage, the transconductance linearly follows the biasing current. It is quite straightforward to tell how much power you will pay for your target gain. They also compare their parameter with the square-law equation using the following figure. Fig. 1 Veff versus VGS-VT . Yes! 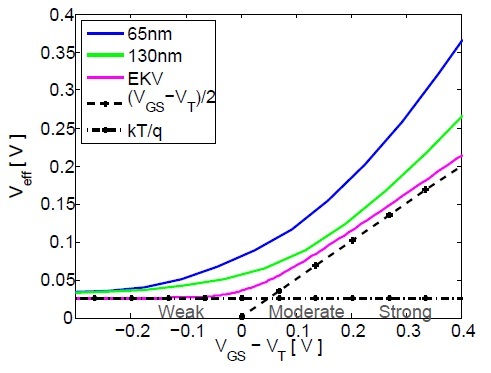 For modern short-channel transistors, they are often biased in the transition region between sub-threshold and saturation regions. They are making classical equations useless! The proposing of Veff is so decent that it provides a simple way for us to analyze the power bounds of analog circuits in modern CMOS . If you ponder on the above simulated curves, do you remember something which also has the beauty of simplicity and continuity? Out of curiosity, I plotted Veff versus VGS-VT based on the EKV model, together with the simulated curves, which I obtained using a similar method as used in  but for different processes. The figure is shown as bellow. Fig. 2 Veff versus VGS-VT with EKV model included (Different inversion regions are also indicated). Though the analog world can’t be as simple as 0 or 1, still the simpler the better! T. Sundström, B. Murmann, and C. Svensson, “Power dissipation bounds for high-speed Nyquist analog-to-digital converters”, TCASI, 2008. C. Svensson and J. J. Wikner, “Power consumption of analog circuits: a tutorial”, Analog Springer, 2010. D. M. Binkley, B. J. Blalock, and J. M. Rochelle, “Optimizing drain current, inversion level, and channel length in analog CMOS design”, Analog Springer, 2006. This entry was posted in MOS Models and tagged EKV, Square-law equation, Veff. Bookmark the permalink.